What, a title?! - All my stories I'm doing! This is the header! I'm working on Super SMSH Bros., a Mario/Sonic/RWBY crossover story. Don't cLick this! Do NOT! I guess nobody cares. How sad. If that's the case, I'll just give up. This story page will be taken down in one week. Need 2 comments for chapter 2! Uuuuhhhh....I need 2 comments in order to start up the five-day countdown for CHAPTER TWO! Here you are! I will need 2 comments to boot up the countdown for chapter 2! Can we do that? If I get enough comments saying you want another sneak peak, I will give you one! But I need more than a "hi". I need you (to pretend) to be extremely excited! Welp, my friend Jordan inadvertently caused the sneak peak to reveal! Awesome! SMSH Bros. is almost here! Is anyone aware of what I'm doing? Well, it's almost here, so at least pretend your excited! Harry the Hammer Bro - This guy is all business when it comes to most things, but he has a soft spot underneath. He tries to stay emotionless, but every now and then, he breaks down. His best friend, Luigi, convinced him to go on the trip to the world of Remnant, and Harry only did it because he told him to. He always tries to stay on the side of justice, despite most of his family working for Bowser. He hates the prejudge that all hammer bros. are evil more than anything. He is extremely smart, which helps in solving puzzles or cracking codes. Sonic the Hedgehog- This hedgehog is literally faster than Yoshi eating a spicy pepper! The origin of him and why he's so fast is unknown, but it becomes clear right away that he is no ordinary hedgehog! He lives in Möbius, with his best friend Tails the fox, acquaintances Shadow the Hedgehog and Knuckles the echidna, and overly-obsessed hedgehog Amy Rose. Although he isn't always very humble, he dedicates himself to stopping the evil Dr. Robotnic from turning the cute creatures of Möbius into robots. When needed, he uses the Chaos Emeralds to turn himself into Super Sonic, although he never really holds onto them for very long. Mario the Italian Plumber - This doesn't need much explaining. It's Mario, the hero of the Mushroom Kingdom. He has a kind heart, but strong fists when it comes to Bowser. Mario normally has a stash of powerups as well as his amazing mustache. He is curious by nature and is normally the first to find out something. Although he could cut down on the pasta. And his relationship with his brother, Luigi, is so strong no hammer could break it! I made some art for the story! Here you are! All of my stories will be put here! Yay! 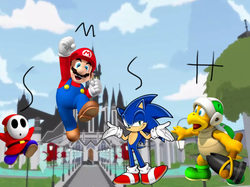 Currently, I'm getting close to posting Super SMSH Bros., an RWBY/Mario/Sonic crossover story.